Steal This Show S01E07: Did P2P Break the Law? Today we bring you the seventh episode of the Steal This Show podcast, discussing the latest file-sharing and copyright news. In this episode we talk with the Techdirt's Mike Masnick and Engine's Evan Engstrom. This episode we are joined by Mike Masnick – CEO & Editor of Techdirt, and Evan Engstrom, Executive Director of Engine. This episode we discuss the extraordinary growth of academic filesharing site SciHub, the new Zeronet distributed torrent application Play, and yet another comeback from Popcorn Time. In addition, we talk about the plague of DMCA takedown notices afflicting YouTube creators and why the law might not survive the acceleration of the digital media landscape… in its present form. 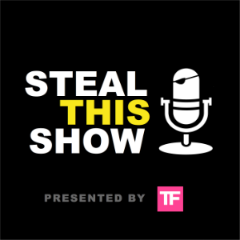 Steal This Show aims to release bi-weekly episodes featuring insiders discussing copyright and file-sharing news. It complements our regular reporting by adding more room for opinion, commentary and analysis. The guests for our news discussions will vary and we’ll aim to introduce voices from different backgrounds and persuasions. In addition to news, STS will also produce features interviewing some of the great innovators and minds. Guests: Mike Masnick and Evan Engstrom.